That’s why they started partnering – 100s of millions of years ago – with very special fungi called mycorrhizal fungi. If I had to narrow it down to the single most important microorganism species for your garden, it would be a mycorrhizal fungus called Glomus intraradices. That’s because it partners up with over 90% of plant species and plays a huge role in the health of our plants and soil. There is no other microorganism that works so closely with plants to bring them nutrients and water and to protect them from root feeding diseases. I have mycorrhizae for sale. Actually, to be more accurate, ‘mycorrhizae’ actually refers to the relationship between the fungi and the root (‘myco’ means fungi and ‘rhiza’ means root). So you can’t buy mycorrhizae, but you can buy mycorrhizal fungi, and it’s often very useful to do so. 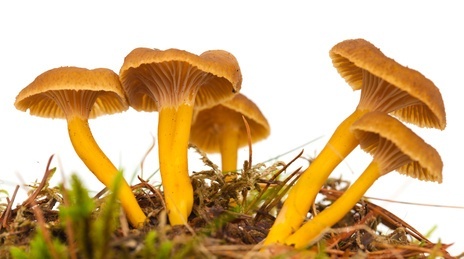 Some mycorrhizal fungi are edible like this Yellowfoot. Mycorrhizal fungi wrap around the roots (and often go inside the roots) of the plants in your garden and then grow out through the soil in every direction, effectively extending the root system of those plants by hundreds of times. They get nutrients out of the soil that plants have a hard time getting themselves, especially phosphorus (which is good because deficient phosphorus is a common reason why our plants aren’t optimally healthy) and also many others. They also hold calcium in the soil – you can go apply a whole bunch of lime, but if you don’t have fungi in the soil, a lot of that lime can leach out very quickly. Mycorrhizal fungi also bring water to plants and protect plant roots from predators, and even invite other beneficial microbes into the root area by feeding them directly. They even connect most of your plants together, giving those plants the ability to share nutrients and other compounds with each other! The reason they do all this is because the plants give them food in return. Some plants will give over 50% of the carbohydrates (which they produce through photosynthesis) to these fungi. This mycorrhizal symbiosis is bartering that’s been going on for millions of years and it’s one of the most important foundations of all life on earth and of the health of your garden. By the way, be sure to read the comparison to both compost tea and SCD/EM on the right side of the page. When possible, I really like to teach you guys how to make these kinds of things for yourself. And it actually is possible to grow your own mycorrhizal inoculant, an inoculant being a culture of microorganisms that you use to establish them in your garden. But it’s no simple task and I don’t see it being worth the effort for home gardeners (other than for fun because it would be cool if you could learn to do it properly). It takes a few months, but if you’re interested, here’s a nice little production guide from Rodale. What they have to do to produce the fungi is grow acres and acres of plants inoculated with mycorrhizal fungi on the roots and then pull up the roots, harvest the fungi, get the spores (which are kind of like the microscopic seeds of fungi), clean them, protect them with a carrier, and – well, it’s a very intensive and delicate process. Some companies are now culturing the fungi in a lab. I have no problem with that in theory, but my understanding is that so far the quality is not there, so I stick with the tried and true method of using inoculants that were grown on plants. So, you can take these mycorrhizal products and apply them directly to your seed and to the roots of your plants when you plant them, and the relationship should begin to form with a few days. I’ve seen incredible results when seeding new lawns and planting new gardens with mycorrhizal fungi products. Forward-thinking landscapers and farmers are onto using it now. Even people who grow world record giant pumpkins are using it, too. Soil that’s been tilled, compacted, water logged or treated with pesticides will often be severely deficient in these important fungi, so that’s when it’s our job to bring them back in. Same goes if you’ve brought in topsoil, potting soil or even compost (they don’t generally exist in compost because they need a plant partner to grow). That’s why I recommend this for almost everyone, as most of us have at least one of these conditions, and because getting these beneficial fungi back into partnership with plant roots can have pretty dramatic impact on plant growth. If you’re working in more of a natural ecosystem, like on the edge of a forest or natural grassland, you can probably skip this one, although you’ll still want it for starting seeds or planting in containers. Source: Mycorrhizal Applications – manufacturer of quality mycorrhizal inoculants. Endomycorrhizal fungi (also called arbuscular mycorrhizal fungi or am fungi) partner up with well over 90% of plant species – most plants. G. Intraradices is included here, along with a few other less important species. Ectomycorrhizal fungi work with less than 5% of plants, so they’re not usually needed in a home food garden, although it doesn’t hurt to have them if you happen to get an inoculant that includes them, and they do associate with some trees including pine, fir, Douglas fir, spruce, hemlock, oak, birch, beech, hickory, alder, willow. I carry a mycorrhizal inoculum that has just the endomycorrhizal fungi, which is the one you need if you’re growing food. I also carry an inoculum that has a mix of both the endo and the ecto, which you may need if you’re planting a mix of deciduous and coniferous trees and shrubs. Unfortunately, most inoculants aren’t great, but there are a few good ones. I’ve spent more time searching for this product than any other, and I was lucky enough to find an excellent manufacturer. I actually worked with them to create a special size just for home gardeners, as they were focusing on creating really high quality inoculants for landscapers and farmers. I’ve learned a lot along the way, so I can share a couple of tips on what you want to look for when buying a mycorrhizal inoculant. The number of mycorrhizal spores is part of the picture. Some products have less than 1000 spores per pound. Some have hundreds of thousands. Spore count alone isn’t all that relevant, though – you need to compare it to price. For example, if a product has twice as many spores as another but costs four times as much, then all else being equal, it’s not a good deal. But spores per pound is not the only relevant part. The quality of the manufacturing process and the health of the spores is just as important. If most of your spores are destroyed or if they’re being packed in an inappropriate carrier, you lose a lot of benefits. I would rather have a lower spore count from a quality manufacturer. This particular product has about 35000 spores per pound, which is way more than the cheap products on the market, but not as high as some others. But where these guys shine is with quality – they’re well known for producing a high quality inoculant. How to tell if a product is of high quality? That’s a hard one. I know just enough about the science of mycorrhizal fungi that I can talk to the manufacturer and tell by how they answer my questions if they know their stuff and if they’re concerned about quality. But other than that, it’s seeing what other people are saying about the mycorrhizal product and looking at the track record of the manufacturer. It takes some hunting. Some manufacturers count ‘propagules’ instead of ‘spores.’ Propagules can include root fragments and other inert materials, so the spore count might actually be much lower. When buying a product, make sure you figure out how many actual spores are in it. And not just spores, but how many G. intraradices spores, or at least endo spores. Endo/ecto blends are going to have way more spores because the ecto are so much smaller and more plentiful, so that makes it looks like they’re a much higher value, but it’s really endo you want to pay attention to in order to compare apples to apples. A point of controversy in the mycorrhizal inoculant world is diversity of species. Some people contend that G. Intraradices is really the only endomycorrhizal species you need, while others claim that a diversity of several endo species is better because each of them will do better in certain conditions with certain plants. The latter has always made sense to me, because more diversity is usually better in nature, but after a lot of reading into this, I believe it’s not as important as you might think. G. Intraradices is the important one. If a product has a few other species, as mine does, that’s probably a good thing, but not too big of a deal. When it comes to ectomycorrhizal fungi, if a product has it, there are usually a handful of species, and it is a good thing in that case because they’re specialists. One more thing. In my opinion, it’s usually best not to buy mycorrhizae for sale with other microbes in it such as bacteria. It’s fashionable in the mycorrhizal fungi products world to add them in, but they probably aren’t helping all that much, and they may be detrimental. Also, in my opinion, don’t buy mycorrhizal inoculants with trichoderma in them. It’s all the rage to include trichoderma fungi these days, and perhaps there are some benefits, but there’s also some evidence that they can interfere with the mycorrhizal fungi. I’m not going to get into that here because I’ve already been rather long-winded, but I’m staying away from trichoderma mixed with myco until I see more evidence. The relationship occurs at the roots, so that’s where you need to do the mycorrhizal inoculation – there’s no benefit spraying it onto plant leaves. That means when you’re sowing seed, sprinkle a little fungi on them first. I’ve often just finished soaking my seed in kelp or sea minerals, and so the fungi sticks to it nicely, but that’s not necessary – just a bonus. When you’re planting, just rub a little bit of inoculant onto the root ball of the plant. If you have an existing landscape with reasonably porous soil (i.e. not heavily compacted) and you’re using a powder inoculant such as my mycorrhizal fungi for sale here (rather than a granular product), you can mix it in water and spray it onto the soil and then water it in and some of it will work its way down to the roots. There’s a little more than 300ml in 1/2 pound of inoculant. When I’m planting small plants, I don’t measure. I just rub some powder onto 1 side of the root ball, less than 1/4 teaspoon for little ‘starts’ such as tomato plants, and more like 1 teaspoon for a 1-gallon pot and 2 teaspoons for a 5-gallon pot. A little is all that’s needed. If you’re planting seedlings, that 1/2 pound can do up to 800 of them if you mix it in water and spray the roots, or just very lightly dip the roots into the powder. For trees, 1/2 pound will do about 30 of them – that’s 2 teaspoons per tree. Use 300ml (1/2 pound) per 1/3 acre worth of seed if you’re going to be mixing it in with your seed before sowing. That means if you’re seeding a typical home lawn, 1/2 pound will be more than plenty, as 1.5 Tablespoons per 1000 square feet is all you need to mix with the seed. If you’re seeding vegetables, 1/2 pound will be even more than more than plenty – they just need an incredibly light dusting. For watering into existing lawns and gardens, we need to apply a lot more. It’s optimal to use at least 300ml (1/2 pound) per 1000 square feet if you’re going to be watering it into an existing lawn or garden, but I’ve discussed this with the manufacturer, and they said that 300 ml (1/2 pound) can do up to 4000 square feet. The fungi will take longer to get established, but it should do so in time. The dilution with water is 1 Tbsp/gallon of water, 20 gallons of water for each 300ml (1/2 pound) of inoculant. When doing this, I’ll usually mix it with liquid seaweed. Irrigate right after application in order to move it down into the root zone. If the soil isn’t porous, you can instead dig a few small holes around each plant and tuck a teaspoon of powder down into each hole. When you buy this fungi, you get enrolled into my online Inoculants course. Mycorrhizal fungi is so easy to use that I actually only have a couple of videos on it in there, but I have other videos on topics such as how to make your own bacteria-based inoculant and discussions on a few other inoculants. The course includes 11 videos totaling about 40 minutes. Helps plants take up phosphorus, nitrogen and many other nutrients, plus water, and also protects plant roots from soil-borne pests. Is probably needed in soils that have previously been tilled, compacted, water-logged, sprayed with pesticides, or left without plant cover. Is organic, OMRI-Listed and non-GMO, and 1/2 pound goes a long way. As a free bonus when you order today, I’ll also enroll you in my Inoculants course. Just choose your size and click ‘Add To Cart’ up above! If you’re a farmer or professional gardener/landscaper who needs bigger quantities, here they are. The shelf life is a minimum of 2 years if stored at room temperature – best to keep them inside. Minimum 2 years if stored at room temperature. It costs $15 to ship a mere 8 ounces of mycorrhizal inoculant? That seems pretty excessive to me. The real shipping costs can’t possibly be anywhere near $15 to ship 8 ounces of a powder. Can you lower the shipping costs? I know, it seems excessive to me, too. But for real, I get charged anywhere from $12-$15 to ship this via UPS, and I actually get decent discounts from them. Plus I have to pay my guys just over $2 to ship it. So ya, I usually lose money on shipping. What most of my customers do is also order a couple of additional products and then the $15 shipping makes more sense. Have you checked out using the US Postal Service? I believe they now offer tracking, and may be a lot cheaper. Yes, I’ve looked into that. In the end, it wasn’t less expensive, but I’ll continue to look for ways to lower costs – expensive shipping hurts me too. Yes, I’ve started using them more often in 2017. I still lose money on shipping, but not as much. Thanks for posting! I, too, had wondered about the high costs of shipping, so I appreciate the frank discussion here. It is refreshing to deal with someone who is open about costs on “the other end” of the shipping deal. Thanks. Are the products, combinations, and applications the same for a perennial flower garden. I don’t have any food plants other than some herbs. Thanks. Yes, it’s all the same for an ornamental/flower garden. Why dont you ship in the flat rate boxes by usps? I have a fulfillment company do my shipping for me, and they don’t offer it as an option. Hi, is it possible to ship to Zagreb, Croatia… and how much would shipping cost. Thanks for the reply. Cheers! Sorry Zida, I can’t ship outside of the U.S.
What is the spore count per gram of your product? 77 spores per gram. It’s not the highest spore count in the industry, but we’ve had professionals, garden centers and product formulators who have moved away from this product to a product with a higher spore count, only to return later because they weren’t getting the results anymore. This is when I started to learn that spore count per weight isn’t a great comparison tool, and that mycorrhizal products are really hard to compare on paper because it’s all about quality. Challenging for a guy like me who likes to make spreadsheets and figure things out by the numbers. is this something that you would apply annually to an existing yard or would one application be enough for several years? One application is enough as long as you’re not using chemicals or doing much tilling. So to use on grass in a yard that is heavy clay, would I need to dig holes every few feet? Or would you still suggest spraying it on, and watering it in well? For heavy clay, I would first rent a core aerator to aerate the lawn (or hire a gardener to do it), and then apply the inoculant immediately after. That will allow it to get down into the root zone. I would also use fertilizers and a light topdressing of good compost at the same time, when you have this opportunity to get it down into the soil. So I imagine that I still want to use bean and pea inoculant, in addition to this? I just read an article that said to use a legume inoculant when planting peas and beans. Is that what this product is, or is it something different? This product is different. Legumes do associate with mycorrhizal fungi and benefit from it, but yes, they benefit from a legume inoculant as well. Hi there! I have a cabin in Wyoming that my family and I visit once a year for two weeks in the summer, typically the end of July. I have two questions for you, 1) how long would shipping take to reach Wyoming (as we are here for only 2 weeks)? 2) will the endo/ectomycorrizhal fungi last through the harsh winter months?Thanks for your help! Darn, I’m so sorry for missing this earlier – my sincere apologies. If you order this weekend, my best bet is that it will arrive on Thursday to Wyoming.Yes, as long as you don’t remove all the plant matter and don’t till the soil, the fungi go dormant in the winter and will be there to stay. How, or where, can I get ahold of Ectomycorrhizal Fungi? I have several oaks and evergreens that I would like to add a little boost to. The Texas weather has them not looking too healthy and I understand that ectomycorrhizal fungi helps with water use and general health of the tree. Am I correct in saying that the ecto fungi will make my trees a little healthier? We water sufficiently but would like to give them a boost. Thanks for your help. Of course it’s not a magic bullet, but yes, mycorrhizal fungi is tremendously important for tree health and can make a big difference. I sell Endo up above as ‘Endo-Ecto Mycorrhizal Fungi’. Ecto almost always comes with Endo, because Endo associates with over 90% of plants, including most of those trees. No, I’m sorry, I only ship in the U.S.
can you mention some names of endomycorrhizae with their scientific names. The endomycorrhizal species are Glomus aggregatum, G. etunicatum, G. clarum, G. deserticola, G. intraradices, G. monosporus, G. mosseae, Gigaspora margarita, and Paraglomus brasilianum.The ectomycorrhizal species are Lacarria laccata, Pisolithus tinctorius, Rhizopogon amylpogon, R. fulvigleba, R. rubescens, R. villosuli, and Scleroderma cepa, S. citrinum. PhilI am pretty sure I have salt toxicity problem in a high tunnel with strawberries. I know that this product cant fix my problem but from what I have read it could help the plants tolerate the problem. Can you speak to that? How much do you recommend per pound of soilless potting mix containing equal amounts of sphagnum peat moss, perlite, coir, and vermiculite. Also, I plan to use the potting mix for indoor vegetable growing (under grow lights) and wonder if I can reuse the potting mix or need to start with new mix after every harvest. Thanks for your help. The recommendation is 1lb of fungi per cubic yard of potting mix (or 2 Tbsp per cubic foot. Personally, I instead inoculate my seeds and plant roots directly, as that uses much less product.As for reusing potting mix, yes you can if it’s healthy and disease-free. But if you grow something that sends its roots all throughout the mix, you may find the mix to be largely unusable and to some extent lower in nutrients, but how much, I’m not sure. No, if you use as directed (like at least a 1:250 ratio of bio ag to water), you will be fine. I am planting 200 bare root grape vines. 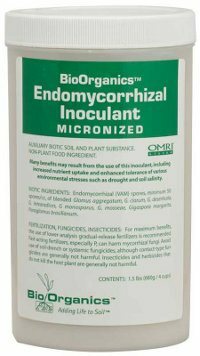 Ho much of the endomycorrhizal innoculum would you recommend per plant? 1/2 pound will be plenty. That’s about 1/3 teaspoon per plant. You could use even less than that but it just becomes an issue of how to work with such tiny amounts, the best answer often being to mix the powder in water and spray all of the roots at once, which is certainly faster. If you do that, just make sure you use a sprayer that hasn’t had chemicals in it, and dissolve the powder really well before spraying. The other option, which for some reason I do more often, is to dust the wet roots with the dry powder by hand, doing a bunch of them at once. Hope that helps. You put a chart showing that Orchids do not respond to this type of mycorrhizal fungus. Do you know what type do they grow in? Various species of basidiomycetes – I don’t think any of them are available to purchase as an inoculant. Hi Charles, the manufacturer recommends 1/2 pound of inoculant per 1000 square feet as being optimal, but I asked them and they told me that for half an acre of existing lawn, the three pound jar should be sufficient – the more you use, the faster the spores will spread, but ultimately it should get to the same point.As for the amount of water, it doesn’t matter – just use whatever you need to cover the whole area. The water doesn’t need to be warm, and the chlorine isn’t the end of the world, but when I do this, I do let the water warm up to ambient temperature, and I do let it sit for 24 hours to dissipate the chlorine, because why not right? I do that even though I water it in afterwards with cold, non-chlorinated water, although ideally, I wait until it’s going to rain. Morning or evening also doesn’t matter much, as long as it gets watered in right away, but I prefer evening to give the spores a little more time to get down into the root zone before the sun is out. Hi Phil!Just placed my order with you. It was difficult deciding which products to go with considering I’m on a $100 budget. But I done research and finally made my decisions. Cannot wait to incorporate them in! What I’m wondering though, is if you have a certain legume inoculant that is your fav? 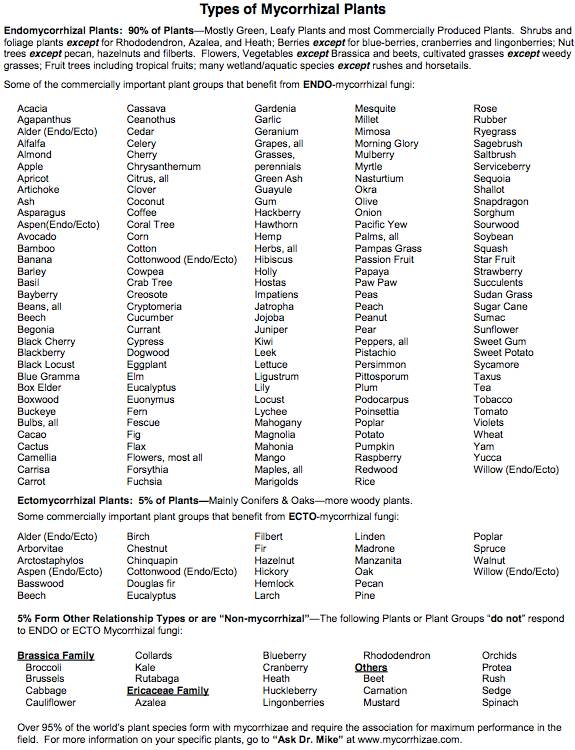 Thank you for doing all this research and making this way of organic gardening easy to understand! You have totally changed my way of thinking about how to grow organically!! Sorry Dee, I don’t have a fav legume inoculant. It’s definitely worthwhile to use, but I haven’t put much time into researching the options. I’m planting 250 bare root Red raspberries spring 2017. I would like to mix the powder in a 5 gallon bucket of water, then dip the roots into the solution and let them soak as I’m planting. I wouldn’t let them soak more than 2 hours. What is the ratio of your mix and water in the 5 gallon bucket for 250 bare root Red Raspberry plants? Sorry for the delay on this – I wanted to ask the producer of this inoculant. I know it would be easier to root dip, but I wouldn’t do it because the spores won’t stick to the roots very well. Instead, I would either sprinkle the powder onto the roots after you’re done soaking them or into the planting hole directly, or water the plants with a water-powder solution after planting. If you sprinkle, 1/2 teaspoon is a good amount for small bare-rooted plants, so 1 pound of the powder for 250 trees. If you water, mix 1 Tbsp of powder per gallon of water and apply 1 quart per plant, which would be 1.5 pounds of the powder for 250 trees. Hope that helps! Thank you for your reply, Phil. If I were to apply a water-powder solution to the roots of the Raspberry canes, how much water and solution would you recommend? Would this be poured onto the roots or sprayed onto the roots? Thanks! I’d much rather it be sprinkled on (I sometimes line up all the bare root balls together and just sprinkle them all at once, so it doesn’t take any time), but if you’d rather mix with water, I’d prefer spraying over pouring because pouring means it may go right past the roots. For spraying, the recommendation is usually 1 Tbsp per gallon of water, but in this case, I’d go more like 4 Tbsp per gallon and then apply about 1 cup of water per plant, so 1.5 pounds of inoculant in 15 gallons of water. Make sure the powder gets dissolved before going through the sprayer, perhaps in some warm (not too hot) water. I grow orchids and recently purchased a terrestrial from a grower who mentioned he plants all of his terrestrials in a peat moss that is mychorrhizal inoculated to help prevent fungus. I called later and spoke to his associate who says they were unable to source the specific product they typically use. I am wondering if I could use your product with the sphagnum moss I have, mix it with perlite and achieve the same medium he was using. I’m also curious as to whether using some in my spray bottle for the other orchids would be beneficial or not. I did find this product online: Premier Tech PRO-MIX HP-CC Mycorrhizae High Porosity Growing Mix, 3.8 Cubic Feet. It is peat/coir based. Do you have any experience or know of anyone with orchid experience and mychorrizal inoculated medium? If I used your product, how much would I use with the moss &/or spray bottle. Orchids are one of the few species of plants that form relationships with different types of mycorrhizal fungi, not the ones I sell. I don’t know if they’re available commercially. Rhizoctonia is the most common fungal genus that associates with orchids, so you should search for that, although if possible, I would also search to see if there’s information on which species of fungi associate with your specific species of orchids. The Premier Tech product won’t work. Good luck! How big is the area? How many plants do you plant? And do you sow seed? Sorry if this has already be addressed, but I am an commercial organic vegetable farmer on 8 acres. I would like to add this product to my potting mix for all of my transplanted crops with is 99% of them, but I have concerns about the tractor work we use for weeding of those crops, and if that will disrupt the mycorrhizae. Obviously we aren’t destroying the plants or their roots when using the tractor. Also, when the crop is finished and we till in the bed, how likely can there be a high survival rate of the fungi after two passes with the tractor? Thank you! Sorry for the delay. The tractor implement for weeding shouldn’t disrupt the mycorrhizae much, if at all. The mycorrhizae will remain with the roots of the crops. As for tilling, there will be a lot of spores left in the soil even after tilling, but it’s difficult to estimate how the tilling will affect it. There certainly will be an effect but there may be enough in the bed to inoculate the next crop. That will always vary. Generally growers will add it again if they are tillingm but often at lower rates. I have about 140 Black walnut saplings in the ground for 2-3 years. Some are doing very well but most are piddling along. I have emailed 2 other sites but for some reason get no response. How can I buy mycorrhizae for my plants? Hi Kent, you can buy the endo/ecto up above on this page. 1.5 pounds will be perfect. Mix the whole container with 35 gallons of water and water each tree’s root zone with 1 quart of that. You don’t need to get all of the roots of each tree – just some of them. When transplanting seedlings, they come out of a small container and I don’t typically break up the soil around the root ball if it’s not too bound up. Do I need to break up the root ball to apply the mycorrhizae? It is typically a 2″ x 2″ x 2″ ball. Do I just put a bit on any portion available? Do I need to cover the whole thing? Finally, I’m doing raised bed gardening using Mel’s mix 1/3 compost, 1/3 peat moss, 1/3 vermiculite. Since I’m not using my own soil, is it as important to use the mycorrhizae? I make my own compost and worm castings that I add whenever I plant something new. What are your thoughts about this? Yes, you definitely want to use a mycorrhizal inoculant in Mel’s Mix, as the spores don’t multiply in compost (they need living plants on which to grow), so they very probably won’t be there. But no, you don’t need to break up the root ball, and you don’t need to cover the whole thing. Just a pinch on 1 side of each root ball will do. That makes sense. I am wondering…this will need to be done yearly as most of the plants in a vegetable garden are annual. I am guessing that the fungi cannot survive from one season to another. I can also, yearly, coat the seed like you say in my transplant containers and they should be ready to go once I teansplant into the garden? Will the fungi do okay in the seedling container for the month-or-so they are indoors? Do you recommend anything else for the raised bed garden? Yes, although there may be some spores that overwinter in the soil, it’s best (and quite economical) to inoculants annual plants each year. And the fungi will be fine in the container. As for other recommendations, yes, I recommend everything I sell, but nothing specific for raised beds that would be different from regular beds. My top 3 for most people are usually the fungi, the EM/Bio Ag, and the liquid seaweed or sea minerals. Is the mycorrhizal inoculant the same as (or better than) IBA (indolebutyric acid) to use as a rooting hormone when planting cuttings? I’ve never seen any comparison. They’re obviously very different, and both can be helpful. 1. I want to start some cuttings from my Japanese Maple, how would you do this? Since the cuttings have no roots how would you apply the Endomycorrhizal Fungi? 2. I buy compost from our local county government by the dump truck load and grow peppers. My understanding is to treat just the transplants not the whole load of compost? Would there be an advantage to treating the whole 20 yards? 3. I also have the Sea Minerals, Compost Tea, Basalt Rock Dust, Gypsum and ProBio Balance. 1. You can put the powder on anyway, as the roots will come soon. 2. No, it’s too expensive to treat the whole thing. Just treat the plants. 3. You can treat the whole garden with these, as the roots will eventually spread everywhere. Hi Phil, Thanks for your sharing your knowledge. My lawn was infected by Take all root fungus which I have been trying to control. Quick question: How often should I apply Endomycorrhizal Fungi to my St. Augustine Lawn for maintenance?. I am already applying ProBio Balance (Mother Culture) along with Molasses every month. The endo usually just needs to happen once on a lawn, as the fungi should get established and then stay there for good. If someone was using pesticides, I’d probably recommend reapplying the endo every year or two, but that’s obviously not the case for most of my readers. Hi, for research purposes, I´m looking for inokulum of Rhizopogon villosulus. It is for project about introduction of Pseudotsuga menziesi in central europe. Is there some chance to buy this specific species from you? Hello! Love your informative website! I purchased your Beginner Gardner three item set. The products arrived the day after I planted 50 plants in a garden pocket tower and ten additional edible plants and flowers in terra-cotta plants. Planted Thursday. Your Beginner Kit arrived Saturday. Sunday, today, I’m able to add the Beginner Kit to the already planted plants. 1. Can I just sprinkle some of the endow powder on the roots of each planted plant by simply moving soil aside and dropping a pinch on each side of root ball? 2. How to apply the liquid seaweed to just planted (within 72 hours) plants? 3. How best to apply the third liquid in the Beginners Kit to my recently planted (72 hours ago) garden pocket tower and potted plants? 1. You could, but easier and just as effective in this case would be to mix the powder with water and just water each plant. That’s usually done at 1 Tbsp per gallon of water, but I’d probably do more like 1 Tbsp per quart for this. This only needs to be done once. 2. Mix it with water in a spray bottle at 1:50 (1 teaspoon per cup of water) and spray the leaves. You could also include 1 Tbsp per quart of water when watering the soil with the fungi. This can be done weekly or monthly. 3. Mix it with water in a spray bottle at 1:250 (1 ml per cup of water, which is slightly less than 1/4 teaspoon) and spray the leaves. Seems small, but it’s all you want to use. This can be done weekly or monthly. You could also include 1 teaspoon per quart of water when watering the soil with the fungi, but just do that once. I look forward to applying your recommendation ASAP! I’m just excited to have found a resource such as you and your website. In the directions above, is #1 referring to the Endo Innoculant, #2 referring to Neptune’s Harvent Seaweed Plant Food, and #3 referring to BioAg? Please clarify which instruction refers to which product. Thank you! Sorry I missed this earlier, Stephanie. Yes, 1-2-3 were just as you thought. II have an in=ground garden 45′ long by 8′ wide. I had a disease in the soil so I haver removed the soil 16′” deep and have brought in 1/2 topsoil and 1/2 premium potting soil. My plan is to let it settle over the next three months before planting. Here is my question. Do I apply the Endomycorrhizal innoculant now (even though there are no plants in the garden) or wait until I plant it in about three months? Thanks. It’s better to wait until you plant. They won’t get established without plant roots there anyway. Yes, mycorrhizal fungi is good for macadamia. You want ‘endo’. Hi, Can you ship AMF inoculant to China or Canada? Is that a pure innoculant ? And May I konw the accurate species name of the AMF? Unfortunately, I can’t ship out of the U.S.
Hello, Im considering using mycorrhizal fungi in my vegetable garden. I use neem oil to control pest but it is also listed as a fungicide too. Do you have any experience using neem oil and growing fungi? Will the application of diluted neem oil negativly affect mycorrhizal growth? My understanding, based only on anecdotes from other growers, is that diluted neem oil doesn’t negatively impact mycorrhizal fungi. Hello, I am considering using mycorrizal incolulant in my vegetable garden. I use neem oil to control pest but it is also listed as a fungicide. Do you use both in the same garden? Will the neem oil negatively affect mycorrizal growth in my garden when applied to my plant leaves? Thanks! Hi, I am doing a research project that involves inoculating Brassica juncea (Kodiak Mustard) to cleanse soil around tailing ponds to reclaim land especially in Alberta, Canada. I have read from another scientist that you can obtain AM fungi from a plant outside, like a sidewalk plant. You can dry the plants root, grind them down and apply it to your plant. How can this work! Please let me know as soon as you can!! And how would I know if mycorrhizal if on a plant and what does it look like?? Hello, thank you in advance. Can I apply your product to plants already potted? Will it leach into the soil and benefit them. Yes, you just mix it in water and water it in. That’s a very common way of doing it. Hi Phil, Tx for the email follow up on my purchases. Am already excited about apparent results with endo powder I used on some sprouted seedlings I started in paper towel medium and transferred to soil blocks. Planted beet seedlings in pots earlier to set a jump start on these little guys and they developed first leaves, but did not grow much in height. Started some more after receiving the endo powder and just applied to the single root before sinking into the soil block. Dramatic difference within 3 day….second group much taller. I know that the first group will have substantially more developed root system, but what a difference!!! Also used endo powder on the single root of some Iris I started from seeds, and they have done GREAT!! Yep….Iris from seeds….who knew!! So just planted 10 raspberries in a new patch. Dusted with endo powder and watered in well with Pro-bio, seaweed and molasses in hose end sprayer….all this make sense on paper…..I hope to see great results in the ground!! I also am interested in this BIO-char product and possibly some home production…..any thought?? Thanks for sharing, Alexis. Biochar is one thing I haven’t gotten into myself. It may be worth experimenting with. Just purchased some of your product. I recently planted bare root shrubs, berries, grapevines and trees. Can a small diameter plant stake be forced down into the roots and pour a small amount of mixed product into the holes to get it to the roots? If so what concentration? Yes, the rule of thumb is 1 teaspoon for smaller plants and 2-3 teaspoons for bigger plants. Alternatively, you can mix the powder in water at 1 Tbsp/gallon of water and just water the plants, doing the math to make sure you end up getting about 1-3 teaspoons per plant. During the growing season, do I need to continue to feed the mycorrhizae if so how much and with what? No, once is all you need. You don’t even need to do it annually (except wherever you’re planting/seeding new plants). Some extremely helpful information in this article. I germinate my seeds using the damp paper method. better to apply to the tap root prior to transplanting? Either way is perfectly fine. Personally, I put it on the seed. 1. wouldnt that stress seedlings and cuase it’s growth to be stunted or at the very least slow it’s growth? also prior to re-visiting your very informative web community here, just bought some great white myco but it contains trychoderma in it. Hi John, seedlings obviously need watering more frequently than established trees. We just want to allow them to dry out enough that their roots begin to search a little further for water. We don’t want the leaves to get to the wilting point, but again, we do want those roots to go exploring. As for Trichoderma, I doubt it will be detrimental. Some folks think it may not be as beneficial having them in there, but I believe that’s still inconclusive. It probably depends on the situation. Anyway, I wouldn’t worry about it. Go ahead and use what you have. of the fertilizer but I have read the synthetic fertilizer will harm the fungi? It can harm the fungi but it depends on a number of factors, like how much fertilizer you use, if it hits the fungi directly, etc. What I would do is apply the fungi on a different day than the miracle grow and also be mindful not to overapply the miracle grow. It’s the same with huma s – spill some vinegar on your skin and you’ll be fine, but take a bath in 20% acetic acid vinegar and you’ll be in trouble. I am doing a science fair project on using a bacteria inoculant to speed up germination of rye seed. I have used garden soil on an agar plate to grow the bacteria but it hasn’t helped speed up the germination. Do you have any advice? Would your product work for rye seed? Yes, it often does speed up germination, perhaps not so much the initial radicle growth, but more so top growth. Of course, a number of factors contribute to germination success, but I would guess you’d have a bit better luck with endomycorrhizal fungi than with bacteria. But also, if you’re using garden soil for both the control and the test, you may already have similar numbers of bacteria and/or fungi in both. Would be better to use sterilized soil in order to control for this. Where I live I have to treat the seed for peas and beans with a fungicide (I use captan). Seems to be a problem with a lot of people where I live. No treat, 3-10% stand — treated almost 100% stand, and I even tried letting the soil warm to 70 degrees or more for the untreated beans. So my question is, would it do any good to still use Mycorrhizal Fungi. I was thinking maybe if treating the seeds was a waste (however this the easiest way), how about if I dug the trench a little deeper and put the Mycorrhizal an inch or two below the seeds. I usually plant double rows 6 – 8 inches apart, and was thinking of a single deeper application between the 2 rows. Also last year I treated most of my vegtables with Mycorrhizol, but as a test left a few tomatoes and peppers untreated. The treated plants were almost twice as nice as the untreated. So I will always treat with Mycorrhizal Fungi (well maybe not what I treat with a fungicide like peas and beans). My sisters also like it, so ordering more for them too. What I would do is come through 2 weeks after planting with the mycorrhizal powder dissolved in water and then water the plants with it (water the soil). I see you don’t ship to Canada, but why does your shipping address include province and postal code ? Is there somewhere in Canada where I can buy this product? What is your exact number of Rhizophagus Intraradices..How many propagules per gram? Our concentration is 10 per cc (about 12-14 per gram is the conversion I think – they are going to switch the label to grams in the future). Total with all species is 50 per cc. Note that their Intraradices are in vivo rather than in vitro. In vitro has higher concentrations but the actual propagules are not as durable or effective. Will you sell Mycorrhizal spores without the diluent ? Hi, I’m for sure need your help… I’m big on organic gardening, …. meant I really love the concept… I have been working so hard for the last 2 years . I do vermacompost and compost… but; nothing seems to work… my compost looks good but don’t do any good to my plants…. worm castings don’t impress me either… I have spent lots of money on so call organic fertilizers… at the end… I have not being able to grow any good veggies… only thing I have grown successfully are hot and bell peppers…. please Help… tell me what I need to buy from you to make it simple and grow tomatoes, lettuces and strawberries to name some. Please help… Don’t know what to buy….. my plants never seem to take over… I’m trying to grow my veggies on raised beds. I need to stick to few products and forget about to millions of them available…. it’s very overwhelming for me… please help….. thanks… I’m glad I found you page…. I start my veggies from seeds… organic which don’t grow good…. Hi, yes I did, and I’m very excited…I have always wanted to have a better understanding on how to grow my own organic vegetables… As far as I know the soil in my garden is mostly clay… my flower garden does very good, but not my vegetables… important to mention…I’m trying to grow my vegetables in raised beds…. I’m very lucky to live an a beautiful property full of trees.. some are oaks.. my back property is about a Quarter of an acre. Unfortunately I don’t have enough sunny area in the back to grow vegetables…. Soooo I built few raised beds.. I make my own compost since I have more leaves that I can wish for. I filled up my boxes with about 70% of compost (mostly screened) 15% peat moss, 5 % worm castings and about 10% black cow manure… added some volcanic sand…. I did this last year and grew some bell peppers … that was about it…. this year I transplanted some of my seeding broccoli lettuces and arugula….. thay are not doing good at all…. looks like the roots don’t go deep and they don’t thrive at all. Too much compost? How can I fix it? Please help. Yes, you’re trying to grow in 100% organic matter. Most plants can’t handle that. A good soil has only 5-10% organic matter (by weight, which is twice as much by volume). In raised beds, we often use 25% organic matter (by volume) when we’re building them and then 75% topsoil. So you’re going to want to remove some of the existing organic matter and save it for somewhere else in your garden, and then get some topsoil to add into the raised beds. That topsoil could be purchased or could come from your yard. If you don’t want to remove too much of the organic matter, you may get away with 50% of it and 50% topsoil, but that would be the minimum amount of topsoil. Be sure to mix them together well with something like a garden fork. You should have better results this year, and then even better next year because the first year with a new growing medium often isn’t as good as subsequent years, as it needs time to settle.